Heat up the oil in a skillet till it’s a little smoky. In the meantime, beat the egg till it’s frothy. Pour the egg into the pan and scramble till it’s puffy. Remove. Add the rice to the pan. Stir and toss. Add the soy sauce a bit at a time, till the rice darkens. Add the scallions. Return the scrambled eggs to the rice and mix well. Add the shrimp till they turn pink. Chicken, ham or whatever the cook wishes may be substituted. Whatever is added should be cooked through. Top with bacon bits if desired. Serves four. 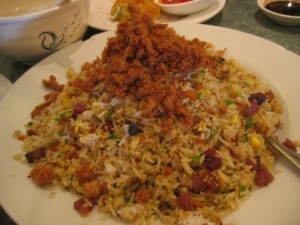 Fried rice with lots of non-rice ingredients is a meal in itself, but plain fried rice can accompany anything, including fish, beef, lamb, pork, and a side vegetable. Drink with a high quality beer, rice wine, or strong tea. Fried rice is nutritious as well. One hundred grams of shrimp fried rice has 4.67 grams of protein, 227 grams of fat, 30.99 grams of carbohydrates and 1.1 grams of total dietary fiber. It also has a goodly amount of minerals, including 10 mg of magnesium, and 55 mg of phosphorus. Enjoy!